In the light of excellent horsemanship on needs to consider the air in which the relationship forms between horse and human. Is it one of Master-Servant? Or, Is it one of Servant-Leader? Susie has a 10 year old QH that is highly bred and extremely versatile. Susie has good riding background but limited ground training. (Notice that I said “Susie” has limited ground training vs. the horse having limited ground training!) … Roger, the QH, INSISTS on flying out the stall door whenever its opened, completely disregarding poor little Susie who tries desperately to stay out of his way yet at the same time, hang onto him. Susie’s trainer has suggested that everytime Roger begins to bolt out of the stall that Susie whack him on the chest with the crop. Susie’s TRIED to do this but Roger seems to be totally oblivious to Susie and her crop and manages every time to just keep on bargin’ through, dragging little Susie behind him. By now you’re thinking “I’d get a chain over that horse’s nose and that horse would learn a lesson or two!” Ah ha! What KIND of lesson would he learn? To be more respectful of Susie or the human standing in his way? Or would he learn to respond to pain, confusion, frustration and determination to get out of the stall and the experience even more quickly? Horses naturally want to get along with their herd members. Part of their social interaction is learning to get along. Learning their own place within the herd and learning to respect those above them in rank. Horses are, by nature, gentle animals with extremely strong ideas about “fairness”. Doesn’t seem fair to me to punish Roger for barging out of the stall when all he wants to do is be a horse and get outdoors to move! Barging through and over human – represents lack of respect for one *supposedly* higher ranking. Represents the need to get out of confinement is greater than the need to be respsectful. Represents the “punishment” is not as strong of a stimulus as getting outside and responding to a natural instinctive call. 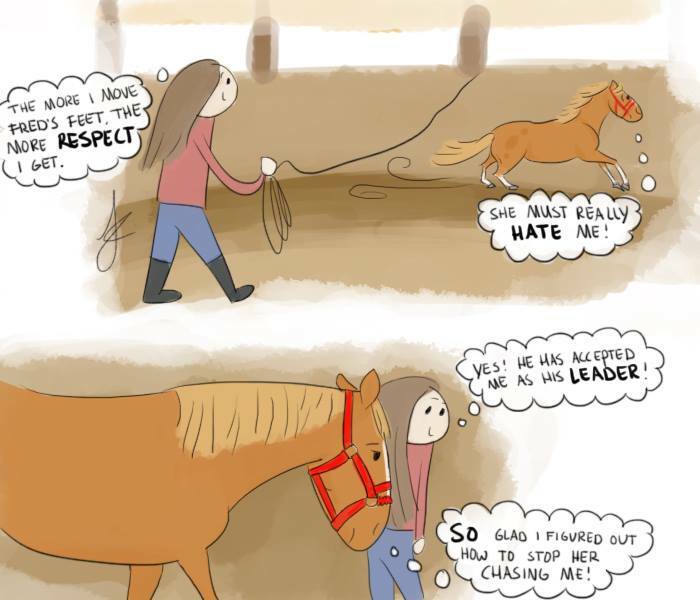 — Issue of repecting higher ranking individual: Not the horse’s fault. Human needs to establish rank in a manner which the horse can understand. — Issue of the stronger instinctual behavior: There is no other motivator involved to override the instinctual need to get out of confinement. If confinement is associated with a pleasant experience that overrides the desire to leave, the horse will stick around! Food rewards, scritch rewards, etc. for a “right” behavior can override as motivators to initiate desired response in behaviors. Bribery, you say? No. M-o-t-i-v-a-t-i-o-n. Every mammal needs motivation to execute a behavior. 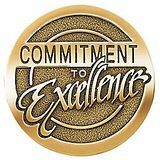 The level of motivation must exceed other motivators in strength in order to prompt behavior. In other words, would you rather “work” for a pat on the head or a homemade chocolate cookie? Personally, the chocolate chip cookie wins hands down for me! Behavior desired = stepping backwards 3 steps when stall door is opened and waiting, respectfully, for human to request forward motion. Must break down the behavior as it is comprised of several “steps”. 1st step would be to step backwards instead of barging forward. “click!” and give 1 or 2 Cheerios as “reward”. Repeat this process until your horse associates your marker sound with the reward. Now you’re ready to begin simple exercise of backing up 3 steps. Ask horse to back up – use pressure and voice command. Instant the horse even thinks to back up, “click” and reward. Repeat several times until you’re receiving 100% result. Ask horse to now actually move body backwards (vs. merely indicating he’s “thinking” about it) … give the cue to back and keep the pressure on the horse until he actually MOVES his body back one step. Click! Reward. Repeat until horse is responding 100%. door!” … So now you’ve added more to the exercises by teaching the horse another opposite of “barging” behavior. You’ve taught him to stand still. Standing still is a CHOICE the horse makes which makes the behavior a decision and not an empty, thoughtless behavior. Think of the difference between, “I’m not doing anything!” and … “I’m doing nothing.” Two completely different behaviors. “Doing nothing” is a decision based behavior. “I’m not doing anything” is a thoughtless, lacking in thought, of doing anything. So, the opposite of “I’m not doing anything” is … “I’m doing *nothing*.” In essence, I’m also saying that we’re teaching the barging horse to “do nothing” while standing quietly and waiting for his human to request forward movement. So, another “opposite” of barging would be to do “nothing”. Whenever you’re working around a horse it is imperative to always think of the consequences of what YOUR behavior and requests will reap from the horse. Every action has a reaction. Our requests have reactions from the horse. They can be thoughtless reactions or they can be thought-FILLED choices that the horse makes. Bucking? Move forward. Rearing? Move forward. Barging? Step back and wait. Jigging? Walk quietly. Doesn’t lift hoof? Lift hoof! Doesn’t lead? Give to pressure. Think of your opposites and start working on them today. You’ll have a safer day and a much more pleasant relationship with your horse. Susie? If that’s you, drop me an email if you’re still getting “stuck” in front of your barging horse and I’ll see what I can do for you! Simply write to gwen.santagate@gmail.com! For years I’ve been harping on energy, intent, intuitiveness with horses, etc. etc. … and this article sums it all up very nicely. I LOVE when I find others who are in tune with life’s energies. And I LOVE when someone asks me about it all and is wanting to learn! I get excited to be able to help someone discover how their energy and intent can not only help their relationships with their horses, but their relationships with other people as well. 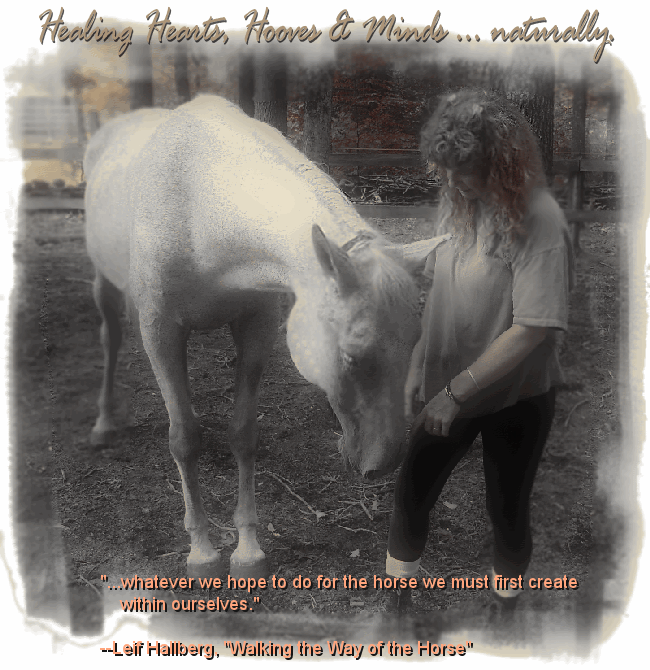 Learning about our horses’ energies will directly affect our own energy and how we use it. It can, if we allow, change our entire world! Be sure to read this article. I know you’ll enjoy it! And if you’re interesting in learning about all this, call me +1 (239) 573-9687 or email to me – gwen.santagate@gmail.com I can help you no matter where you are in the world! 🙂 Remember — we’re all connected.